Why does this album exist? Two years ago, Pesky J Nixon released their debut, Good Grief. Now here is the follow-up, sort of. 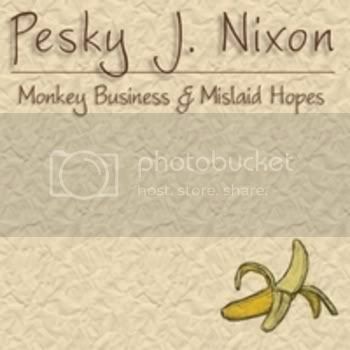 Monkey Business & Mislaid Hopes has a running time of about 39 minutes, for nine songs. The last two songs are radio edits of songs included in full-length versions earlier in the album. If you have a copy of Good Grief, you will find some of the song titles here familiar. In fact, there is only one new song here. So what gives, and why am I recommending this? Because, despite what I have said so far, this is a new album, and a fine one. Two years ago, on Good Grief, Pesky J Nixon was a four piece band. Now, bassist Zack Root has left. Where before the band recorded as a quartet, playing and singing all of the instruments themselves, now they are a trio, and they bring in a raft of players to help realize their sound. So Good Grief was a good album too, but where the songs sometimes sounded like demos there, here they are fully realized. The basic trio of guitars, keyboards, and percussion is augmented with bass, fiddle, banjo, and mandolin in places. The keyboards include piano and accordion, as well as harmonica, and the percussion includes a variety of hand drums and shakers. There also finely layered background vocals. So the arrangements here are richly textured, but always in service of the song. And what songs! Pesky J Nixon boasts two fine songwriters, Ethan Scott Baird and Jacob Bush. It’s surprising enough to find two strong songwriters in the same group, but here their styles are so compatible that the album has a unified narrative voice. These are songs of partings, taken with the best possible grace. Who Will Love You opens the album, and starts out sounding like it’s going to be a jealous plea for a lover to return. But, it turns out that the narrator recognizes that he has hurt her, and she isn’t coming back, and he simply hopes that someone will take as good care of her as he wanted to. Breathe in Autumn equates the cooling of a relationship with the cooling of the weather, and the metaphor really works. Atlanta starts with two friends who haven’t seen much of each other in the last few years; as time continues to move, the one friend manages to show up only when he is needed most. This song has the quality of a classic, and deserves to find the widest possible audience. Fade has another great metaphor, equating the state of a relationship with the reception of a distant radio station. And the rest of the songs are just as good, although these moved me personally the most. So next time I hope to hear a collection of newly written songs from these guys, and I hope there is more music. But, for now, I am very happy to have this document of the state of the band. My only question is, how do they perform these songs live? I am hoping to find out next week at the Falcon Ridge Folk Festival.